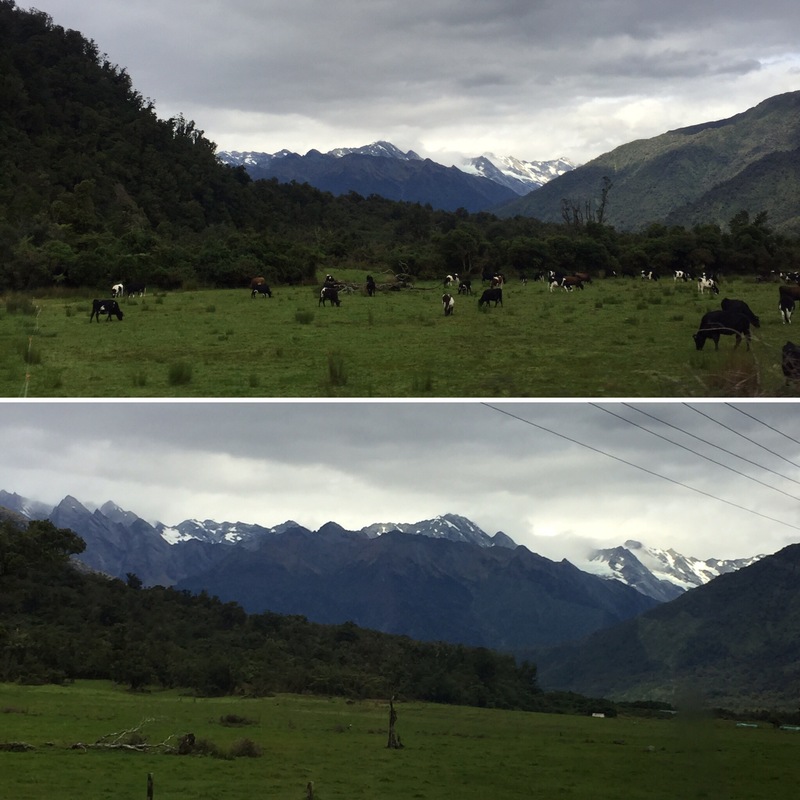 On the 12th April we left Lake Mahinapua and drove through the southern alps for the rest of the day. It was really pretty with deep canyons and nothing but tall mountains and forests all around us. It was quite cloudy which meant we couldn’t see the amazing scenery as clearly as we would have liked but it was good to be in the mountainous regions we had heard so much about. We spent all morning driving to our destination in Franz Josef and we arrived at our hostel – a nice alpine style place which had a bar with Bavarian style long tables and a very friendly Labrador as the hostel pet – in the early afternoon.We had clear skies and, as we hadn’t seen that in a while, we didn’t want to miss our chance to see the Glacier incase it clouded over again and so all got ready to take a walk and see the Glacier that afternoon. 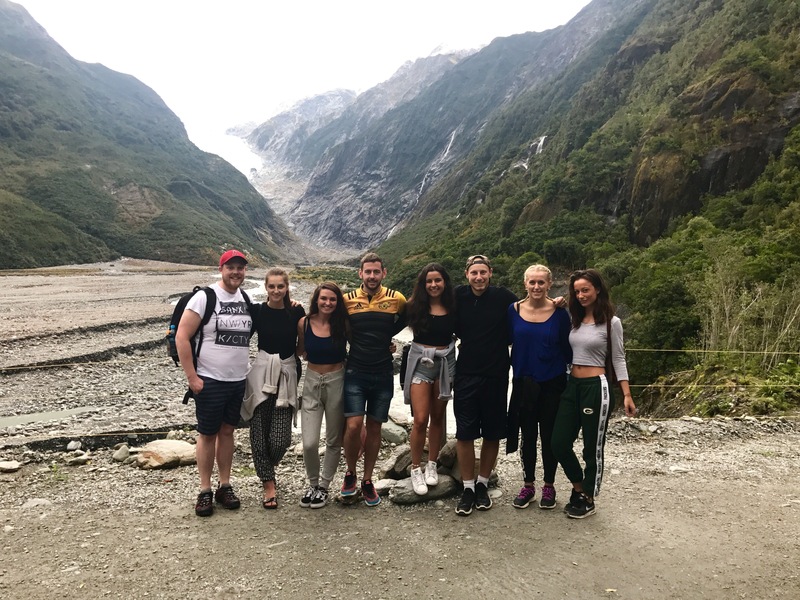 Myself, Niall, Padraig, James, Bethany, Laura, Annie and Megan (all our new friends from Westport/Lake Mahinapua) walked 8 miles that day which one of the girls told us was 480% of our recommended daily exercise – pretty good going really! 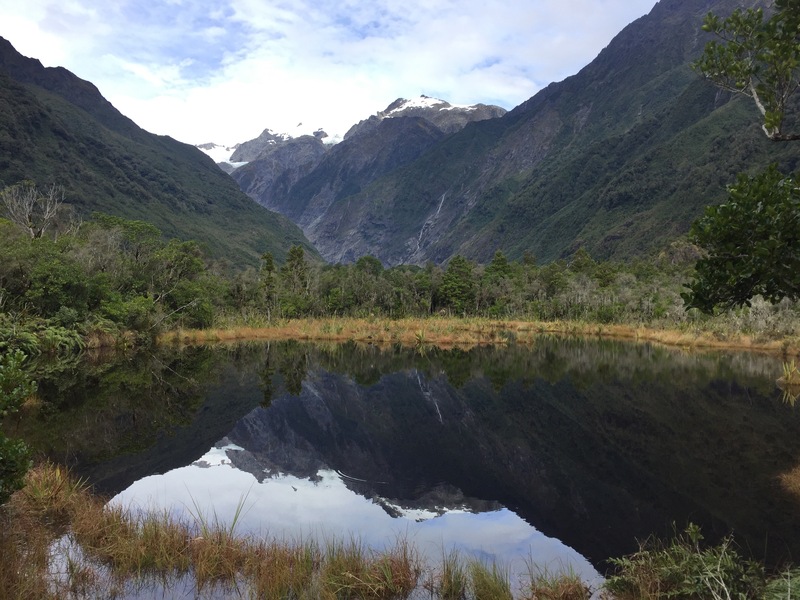 Our aim was to see the Franz Josef Glacier which can be seen on a valley walk which takes you right to the bottom of it. 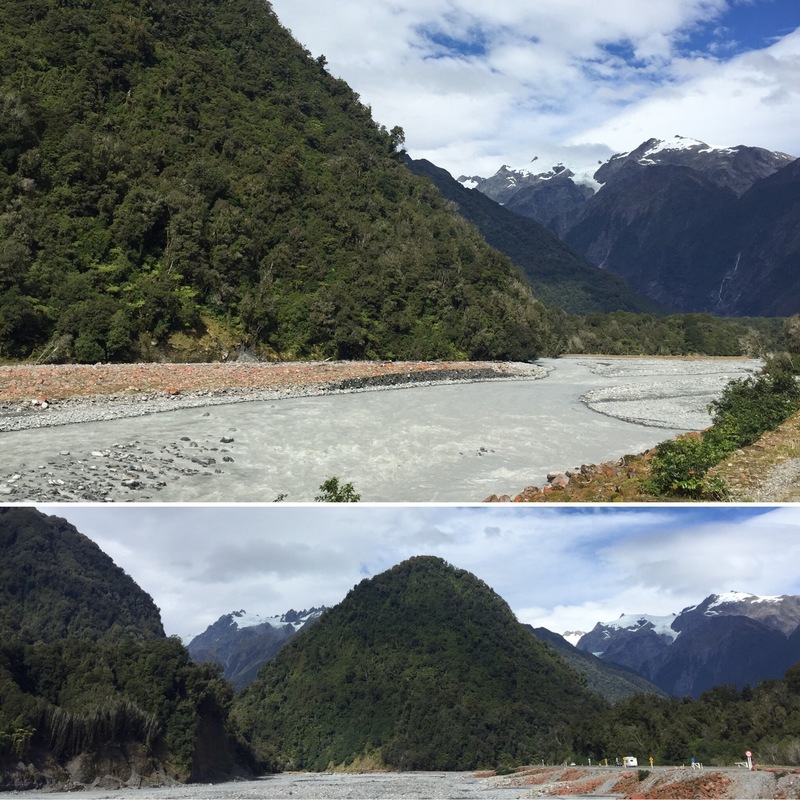 The walk takes you out of the village and along a bridge which crosses a very grey river – it looks really chalky so I think it’s that colour because of the rocks and soil in the area. 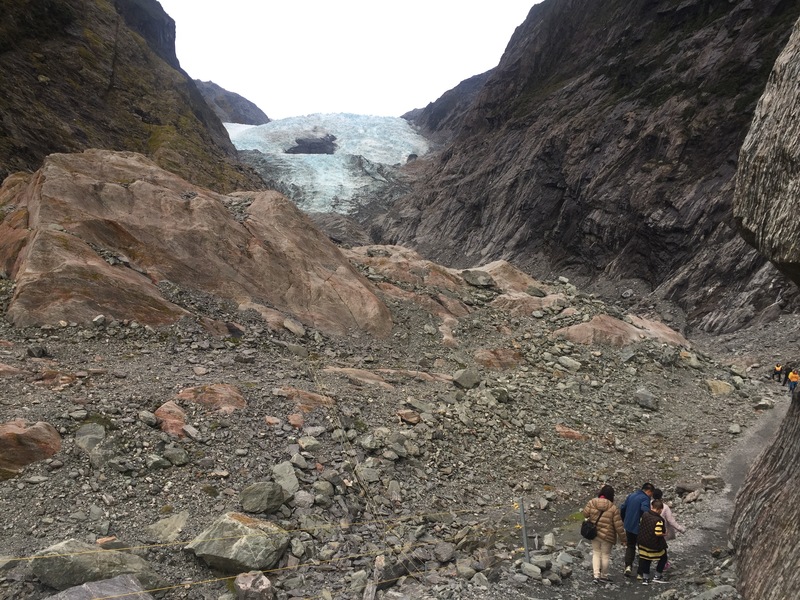 You then walk through a forest track which takes you to a carpark (you can get the bus which would bypass the track) and that takes you to a second track which leads into the Glacier valley. It was a nice walk – albeit slightly longer than anticipated – and thankfully wasn’t very hilly. 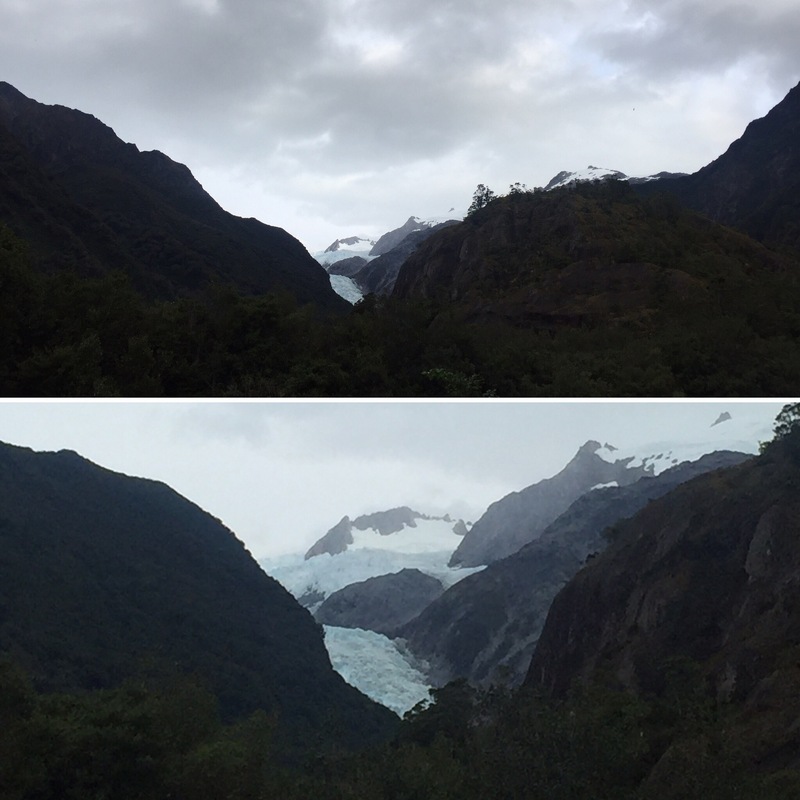 Once you’re in the valley you get your first close glimpse of the glacier. 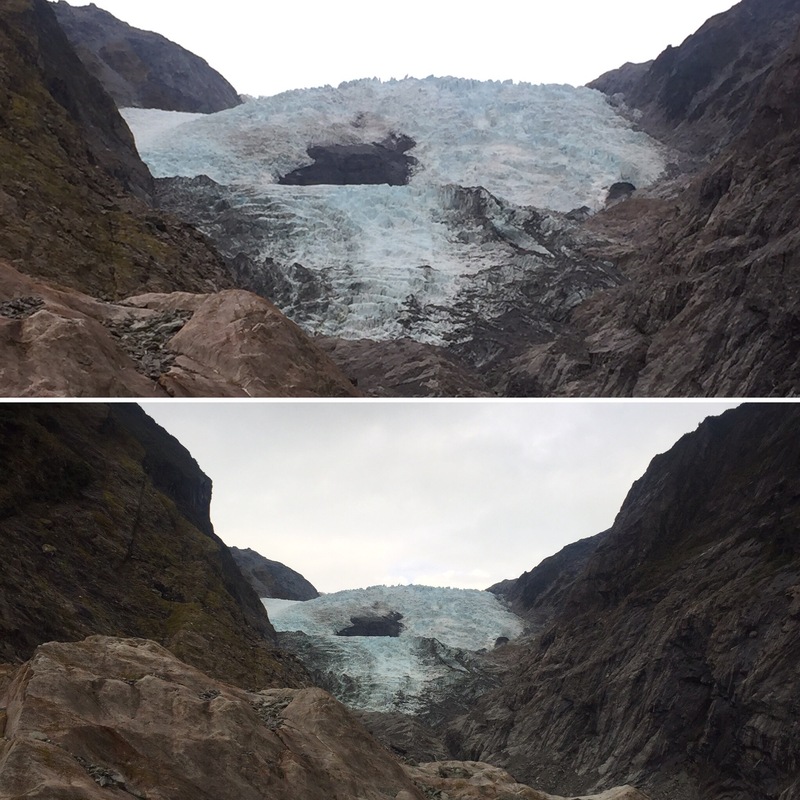 This is a mass of ice that looks like the water froze as it was mid flow through the canyon (thinking about it, that’s likely to be what actually happened) and it is incredible the scale of the thing between the two giant mountains. 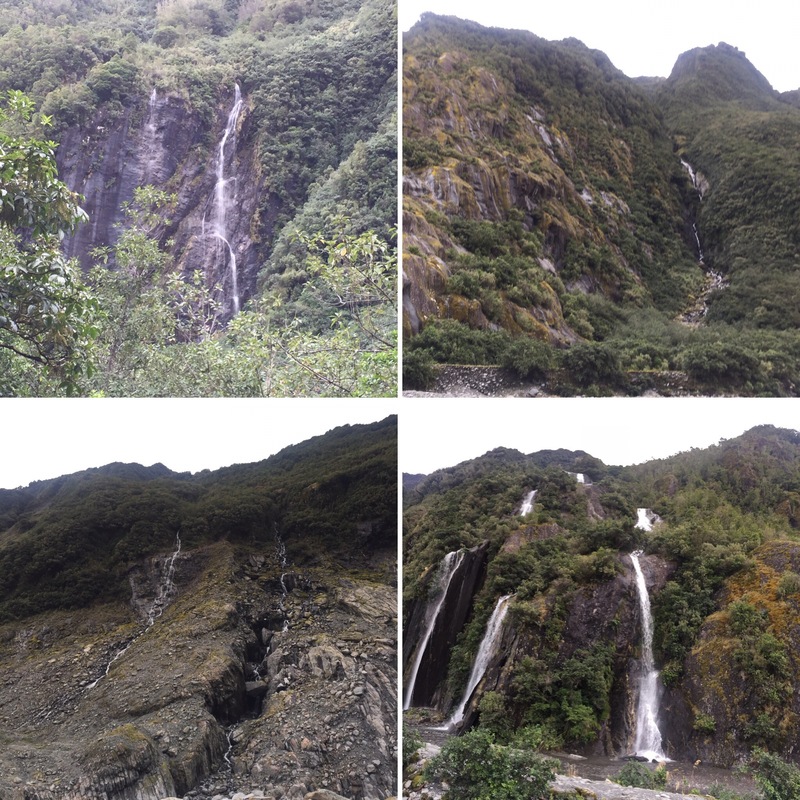 The walk through the valley is a good one with some waterfalls along the way and the Glacier always in sight. We then decided to get the bus back as it was getting dark. That night I took part in the pizza night that was happening at the hostel. They would keep bringing out pizza for a few hours until everyone was full or it reached 9pm and they also had chips and garlic bread too so I got a lot of food. It was a bit harder for me as I’m a vegetarian so couldn’t eat every type of pizza but all of our new friends were great at making sure they gave us vegetarian pizzas and giving me loads of it when they came round! Niall hadn’t been as bothered by the pizza (it’s one of my favourite foods so I found it too hard to resist) and so he met us afterwards for drinks. The hostel bar held a competition where you could win some prizes and our friend Callum entered it to win a bungy jump for Niall which was very sweet (Callum had no interest in doing a bungy jump himself). 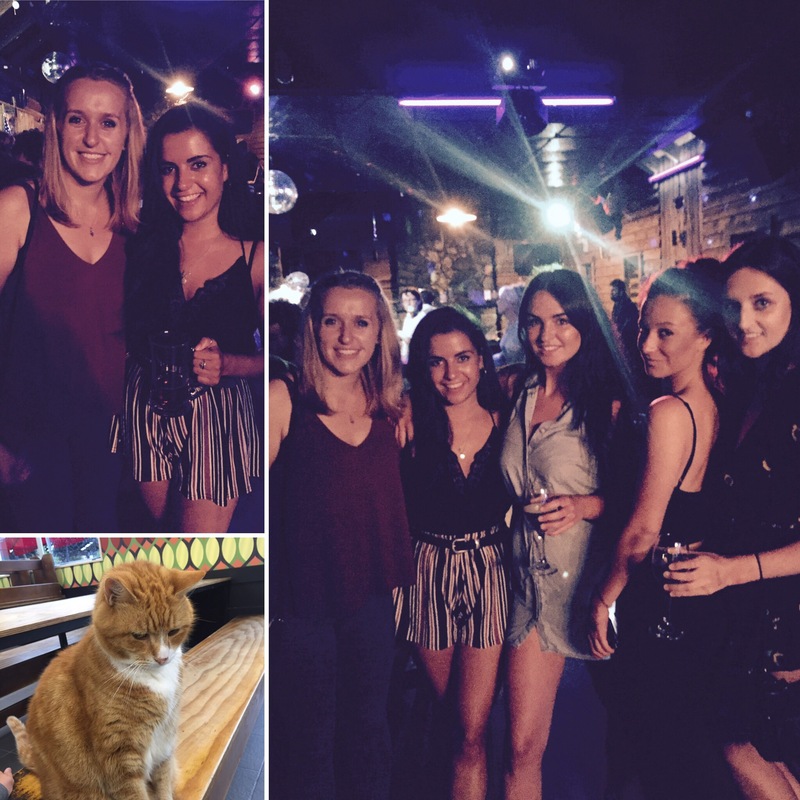 The competition had different rounds that involved everything from races to swapping clothes with girls in the bar and each round began with a shot – it looked like a lot of fun. Callum ended up coming second and won a 2 for 1 canyoning trip which he still wanted Niall to have – he’s just the nicest guy! 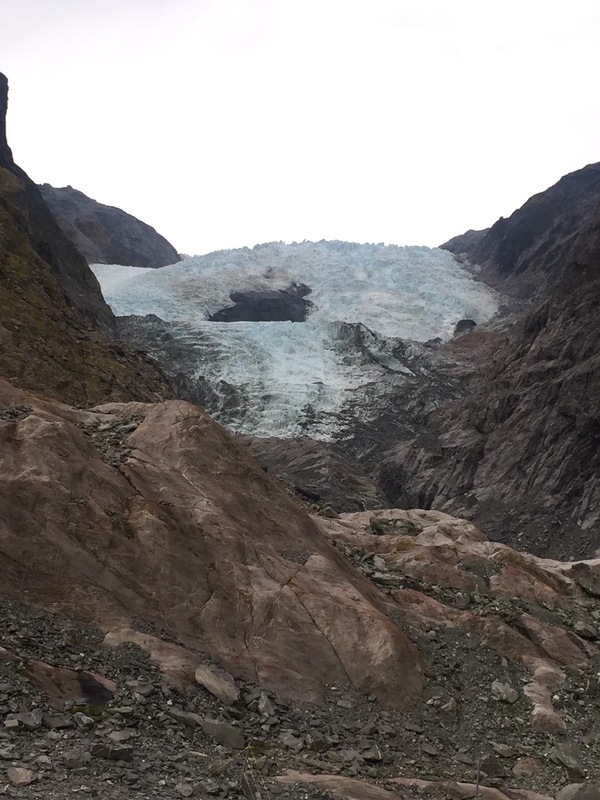 The next day, we woke up early to try and get to do a heli-hike over the Franz Josef Glacier (the only way you can get on the Glacier itself) but it had started to rain so we didn’t get to go up. The weather has to be perfect for the day as they need around a 4 hour window to fly you up there, have you walk on the Glacier and then fly you back down and so rain and low cloud cover makes this impossible. We were disappointed but there wasn’t anything we could do about it and the forecast was set to be the same the rest of the week so it wasn’t like we could even wait it out and then do it another day! This did mean we had the full day to kill so we all chilled together and then some people went to the Hot Pools (which has a 40 degree jacuzzi) whilst we walked to a place called Peter’s Pool. This pool is a kettle lake, which is a lake formed by a huge block of ice that was left from the glaciers withdrawing over the land. 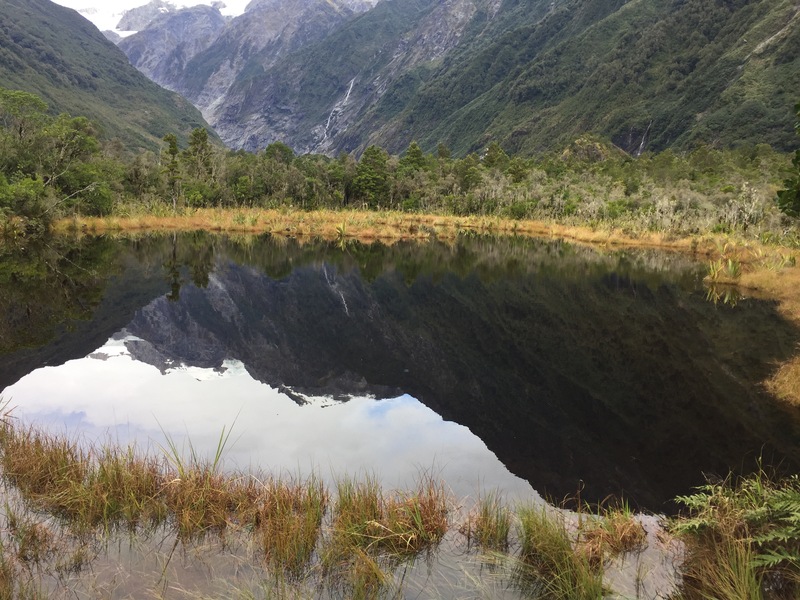 The ice then melted into a depression in the ground referred to as a ‘kettle hole’ causing the small lake to remain and creating a beautiful reflection on the surrounding mountain range – it’s a lovely spot to come visit. We didn’t do much the rest of the day and ended our time in Franz Josef having drinks all together. 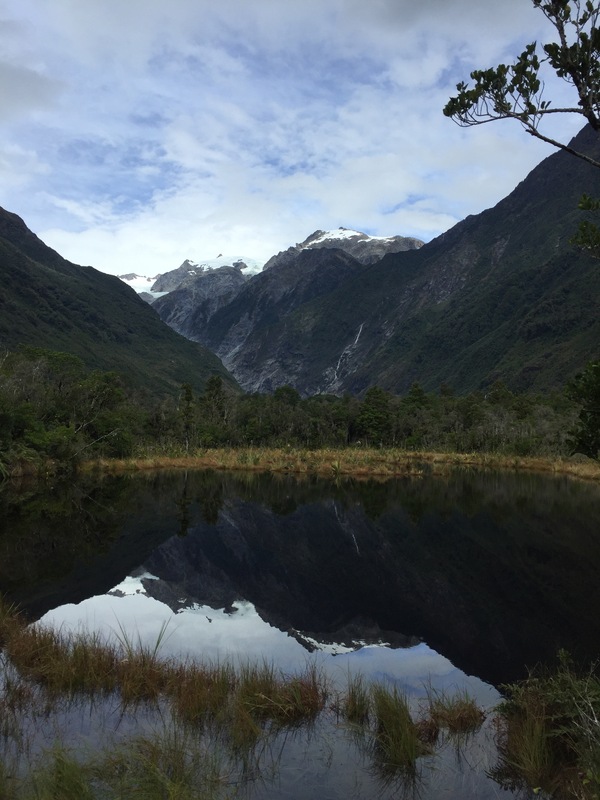 Franz Josef is a lovely little mountain town and worth a visit, particularly if you want to do the hike onto the Glacier. 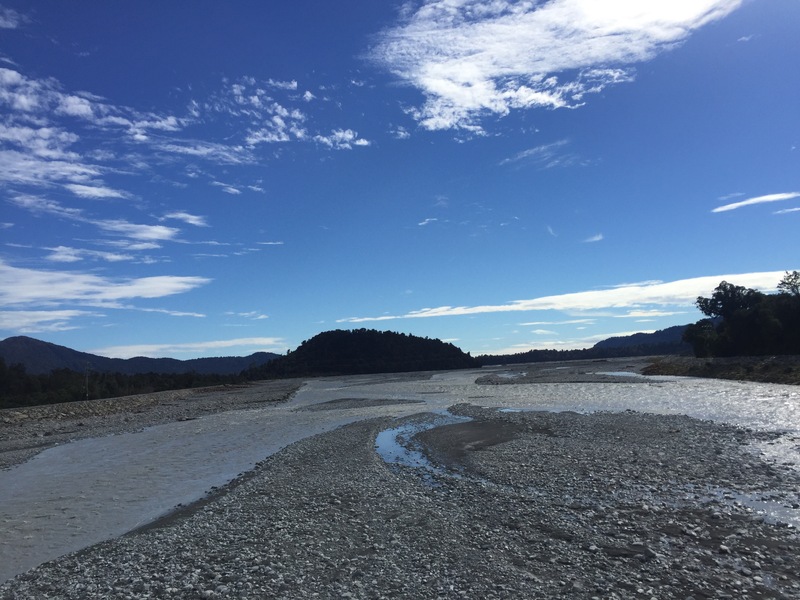 It was a shame we couldn’t do it as we have seen pictures and have friends who were lucky with the weather who said it was incredible but we still enjoyed our time here and would recommend it during your travels of the South Island.